Psychologist, state-certified Psychotherapist, field supervisor, instructor for Systemic Family Therapy and Advanced trainings for constellation work throughout the world, Guni Baxa has a fascinating history to draw from. 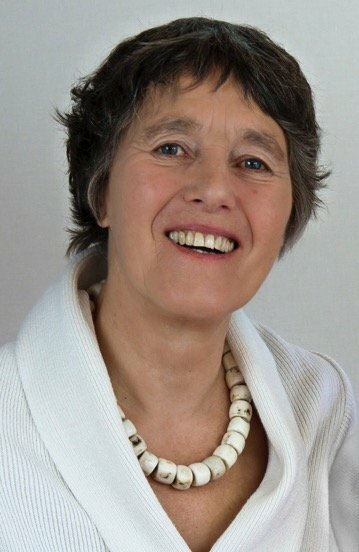 As one of the co-founders of APSYS (Institute for Systemic Practice and Reconstruction Work) in Southern Germany, Guni had the opportunity to train herself in many of the approaches of humanistic psychology. She met Bert Hellinger in 1970, very early in her professional life. In Europe this was a fascinating and sometimes wild time – a time connected to an atmosphere of change and a pioneering spirit. Guni also studied with Virginia Satir, one of the better-known family therapists of the 20th century. Guni also trained in other approaches, like Gestalt, Bioenergetics, Biodynamics, breathing techniques, Transactional Analysis, and later the very resource-oriented approaches like Hypnotherapy, NLP and Family Therapy. For all these years Guni has stayed in touch with Bert Hellinger. Bert’s very essential insights offered a deep understanding of dynamics within systems, especially family systems. For years Bert was extending and refining these profound insights and was facilitating the constellations in the so-called ‘classical style’. After quite a while (around 1994) the constellation field opened up for different areas like education, health issues or organisations. It opened up for collective issues, like dealing with the perpetrator victim dynamics and opened up for the universal/spiritual dimensions of life. Bert experimented with movements of the soul and developed movements of the spirit; all aspects which nowadays are practiced in multifaceted ways in the field of constellation work. Guni combined Bert’s insights with the work of Virginia Satir. She also started to explore possibilities – in connection with her colleagues Matthias Varga von Kibed and Insa Sparrer – to set up other systems, not only families. These for example could be psychic mental systems, the medicine wheel or the chakra system or basic capacities of a system like autonomy and belonging. Out of these explorations developed the now very well known ‘Structural Constellation Work’. Considering the origins of her work, Guni feels that Bert Hellinger is the ‘father’ at her back and Virginia Satir is the ‘mother’. Her colleagues she feels as brothers and sisters at her side. In the last few years she has found her own way in also including ritualistic procedures and Daan van Kampenhout’s Systemic Ritual into her work. Costs: The price for this conference is £325, but if you would like to book before 30st November 2018 there is an early bird price of £265 available. In all social areas (individuals, families, organisations, institutions, groups, religious or political parties etc.) the balance between autonomy and belonging plays a significant role. Autonomy and belonging are equal, yet polar tendencies. The opposites continually pose the question: How can we maintain our wholeness and simultaneously belong to something bigger without sacrificing one for the other? How can we assert and protect our boundaries and simultaneously belong, adjust and adapt to the “others”, to the environment? Understanding this basic need for balance between autonomy and belonging led to the recognition that many symptoms/disruptions/issues within us are related to an imbalance of these two forces. Setting them up in a constellation can clarify conflicts between freedom and love, inner and outer navigation, separation and union, rights and obligations, individuality and belonging, Yin and Yang or the opposites between the survival of the species and the survival of the self – just to mention a few. Jesus answered, when asked for his most important teaching for humanity. “Love thy neighbour as yourself”. Jesus was relating to the healing quality gained from balancing autonomy (love yourself) and connection/belonging (love thy neighbour) within ourselves. Love thy neighbour as yourself. As the very essential capacities of ourselves this balance deeply connects us with our center. During the workshop there will be an interplay between constellations, resource-oriented ritualistic procedures and exercises connected to our theme, sharing and – according to the needs of the group – theory. Fee: £325 The early bird fee of £260 is available until 30th November 2018.